Proposals to bring more port related activity back to Whitby have taken another step forward. Following the Meeting of Whitby Harbour Board and Scarborough Council’s Cabinet last week Members agreed that part of the Endeavour Wharf be offered for lease by competitive tender. The report presented to councillors showed that in recent months the council had received a number of enquiries from those wishing to use the port, particularly Endeavour Wharf, to support various offshore activities in the North Sea. As a result and given the increase of activity and government policy relating to new offshore wind development, it is considered a good time to offer part of Endeavour Wharf for lease. The report outlined that proposals would only be invited for activity in keeping with the operations of a port and in line with permitted development, i.e. in support of the shipping of people, goods, cargo etc. Cabinet’s decision represents the first formal step in the process of trying to secure new business and employment activity in the port. If any tenders come forward, the details of the proposals and the decision on whether to enter into any lease would be subject to evaluation and consultation over the coming months. “This is the next significant step in a long line of activity that the council and Whitby Harbour Board have been undertaking to try and secure more marine related activity in Whitby, particularly in support of the Offshore Wind industry. “Whitby port is ideally located to serve the North Sea for a diverse range of maritime operations. Diversification of the business activity undertaken at the port is essential if we are to secure new employment and economic growth for the town. Endeavour Wharf, the former cargo wharf, was last used for that purpose by Associated British Ports (APB) in the 1990s for the handling of steel and timber. The wharf is approximately 9,000sqm in area and primarily used for parking and fishing vessel berthing at the current time. Approximately 2,200sqm of the wharf will be offered for lease. The tender period started on 24 June and will run until 5 August this year. Any proposals which are received will then be evaluated and presented to stakeholders and councillors in September. 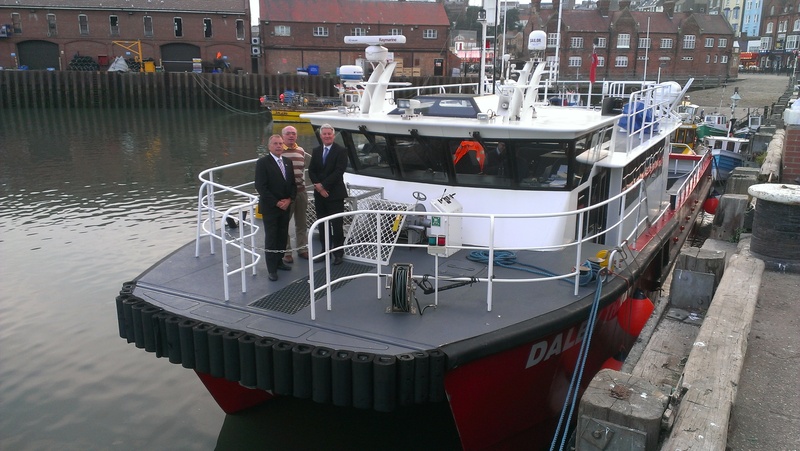 The first offshore wind support vessel ever to be based in Scarborough harbour took up its berth at the weekend. The vessel’s arrival marks the start of what Yorkshire’s business community predict will be a brand new industry for the coastal area, which in the longer term is set to bring a wealth of benefits to the local and regional economy through direct investment, jobs and demand for supporting industries. The 22m vessel ‘Dalby Trent’, owned by Dalby Offshore Renewables, will be using Scarborough harbour as its home port after the company recently won contracts on the Westermost Rough offshore wind development. Westermost Rough is located in the North Sea approx 8km off the Yorkshire Coast, south of Scarborough. The development, which is being undertaken by DONG Energy, is currently under construction. When complete it will consist of 35, six megawatt (MW), turbines, covering a total area of 35km2 and providing enough electricity to power around 200,000 homes. “It is fantastic to be able to run this vessel out of Scarborough. My family and I live in the Scarborough area and we are very pleased to be bringing some of this activity and employment to the town; the crew are also local. “The offshore wind sector is set to boom over the coming 18 to 24 months and both Scarborough and Whitby ports have a very strong opportunity to secure some of the action. We will do everything possible to ensure we accommodate this and future vessels into the harbor. “We have been working closely with the Government and the offshore industry over the past three years to ensure the borough wins its place at the table when offshore wind developments take place off the Yorkshire Coast. Dalby Offshore Renewables is the first such support company to utilise the port and we believe this will prove to be a test bed for a growth of activity over the coming months. Dalby Offshore Services Ltd currently owns, operates and charters eleven offshore support vessels, six of which are wind farm related, including a large accommodation and cable laying vessel ASV Pioneer. The company at this time is involved in the provision of a wide variety of offshore services around the globe including crew transfer, operations and maintenance activity, cable laying, offshore accommodation provision, maritime survey activity, workforce welfare etc. The company’s head office is located in Beverley employing approximately 12 people with more than 65 employees based offshore. It is also part of the international salvage team currently tasked with raising the ill-fated luxury liner “Costa Concordia” from the coast of the Island of Gigolo in Italy.